What common social media mistakes do small businesses make? Social media is something EVERY small business should be utilising, but as any marketer knows, using it can be a bit of a tightrope. If you nail it, you can end up with your very own community of hungry leads, looking up to you as a thought leader and the go-to source in your field. If you mess it up, you can cause brand damage which you might never repair. For example, social media screw-ups in the last 12 months include the poorly-worded Adidas tweet, “Congrats, you survived the Boston Marathon!”, which recalled 2013’s Boston Marathon bombing, and this tasteless Facebook advert for mattresses, which has haunted the Miracle Mattress company ever since. When social media first began to flourish as a business tool, the ultimate aim was for your content to “go viral”. Now, in 2017, most small businesses recognise that there is a less dramatic but far more reliable way to promote a company through Facebook, Twitter, and the rest. This involves regular updates, the proliferation of useful, shareable content, and an easy point of contact for any potential customer to use to get in touch. Even if your company manages to avoid making near-fatal blunders like the Adidas and Miracle Mattress mistakes described above, there are still plenty of other ways to sabotage your own content. Whether these errors stunt your social media reach, irritate other users, or are simply neglectful of your audience, here are 5 social media mistakes that every success-seeking small business needs to stop doing – now. Everyone knows at least one Facebook user or company that clogs their timeline with post after post after post. The terrible irony is that it doesn’t even matter if the content is of a high quality or not: users simply don’t want to see their pages flooded by the same profile. Now, through a combination of social media algorithms and settings, people are more likely to see the posts they care about and see fewer of those that bore or annoy them. Facebook has recognised that its users want to be in total control of their timelines, and for this reason most have introduced a handy “unfollow” option, which can be used to unfollow both friends and brands. It’s easy to feel spammed by another user’s constant posting, so to help counter this, everyone is just one click away from banishing another profile’s posts from their timeline forever – or being banished themselves. That’s why it is no longer sufficient to brag about your vast number of page fans or followers, if only half of them are receiving your posts. To find out if you are posting too much, start by asking yourself, are your followers interacting with your posts? Are you posting several times a day, but receiving no traction? If a page you were following posted as frequently as you were, would you feel as though they were spamming you? If the answer is yes to any of these questions, you will want to reconsider your social media marketing strategy, and the first place to start may be to reduce the number of times you post each day. The other side of the social media posting coin is the problem of under-posting. A study from The Social Habit demonstrates that 53% of Americans who follow brands on social media are more loyal to those brands. A company’s social media page is often the first port of call that a potential customer makes when they first begin to explore a new company’s output, so how is your company going to convince a visitor to follow your page or earn their loyalty if you post a one-word update once every week? An inactive social media account – particularly on social media giants such as Twitter and Facebook – reflect poorly on a company, suggesting that they are either slapdash or behind the times. So, if you shouldn’t over-post or under-post, the question is, how frequently should a company be posting to social media? A commonly-quoted stat is that Facebook marketing should involve two posts per day, but as you might expect, the truth is more complicated. According to a study from marketing gurus hubspot.com, if you have a following of fewer than 10,000, posting twice each day is likely to reduce the number of clicks that each of your posts receive by half. The most practical advice we can give for social media marketing post frequency is to trial what works for your small business. Test different amounts of posts for short bursts of time, and when a strategy seems to work, stay with it and build upon it. If your posts don’t gain any traction, try a new strategy and see if that works more effectively, changing tactics until you find something that does. Any self-respecting entrepreneur should know that “sucking up” is a bad idea, but if that is the case, why do so many people continue to do it? I refer to excessive “likes” on other people’s posts, overly-complimentary comments, and desperate attempts to attract attention to yourself by hijacking another thought leader’s updates, blogs and video comments. By gushing compliments over a social media user who you wish to connect with, you immediately establish a power relationship that plays down your own relevance. You cheapen your own input and worth, and appear desperate, which is a massive turn-off for anyone who may have been interested in connecting with you. To clarify: genuine flattery is of course an accepted feature of marketing, and compliments without playing down your own importance can make for an effective gambit. However, keep them respectful and sincere. People go to social media to socialise and learn, above all else – and this includes professional networks such as LinkedIn. While one study showed that 24% of users follow brands to find gift inspiration, the majority do not usually visit Facebook, Twitter, Pinterest or Google+ with the intention to shop and buy, particularly if you sell corporate or B2B products and services. Instead of thrusting your products in people’s faces, try to share valuable and entertaining information that will make other users want to share your content with their friends and followers. You should be aiming to establish yourself and your company as a dependable brand and a trend-setter, helping others to recognise your expertise in a certain area(s) so they come to of you whenever they think of the market niche you would like to represent. In short: provide a service and educate via social media by sharing blogs and valuable content, rather than simply advertising your wares 24/7. Social media should be exactly that – social – so why are there still social media users who are ignoring their followers? By failing to respond, you are effectively shutting down any opportunity you had to extend the dialogue with them. When a social media user comments on a post or picture of yours or your company’s, it is your opportunity to begin communicating with them, or at the least to acknowledge that they have taken the time to get in touch with you. While it would be nice to suggest a flat rule such as, “You should respond to every comment you receive”, as is usually the case with social media, the answer is a more nuanced. According to a report from Cornell University, it pays to give a 40% response rate to social media comments and reviews. After this approximate reply rate, there is likely to be a point of diminishing returns and the positive impact is likely to lessen, or even worsen, as contradictory as that might appear. For this reason, it is advisable to acknowledge all comments if possible, but to respond more selectively. We wish that there was a magic solution for your small business social media marketing that we could bottle up and serve to you with your lunch – but there isn’t. 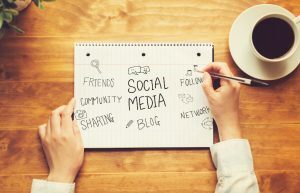 Small businesses use social media as part of their marketing campaign to sell their products, to gain and nurture leads, to learn from other businesses, to extend their reach and simply to get their company’s name into the heads of anyone who might be interested in what they are looking to sell. Above all, the aim of any small business social media marketing campaign should be to grow your brand, and position it as a company to be contacted if a person or company wants to learn more about the market niche the business specialises in.